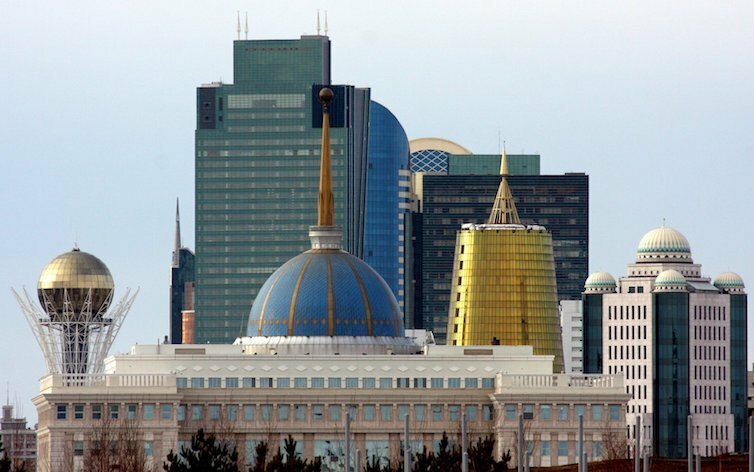 A group of men from the Czech Republic who stripped off to don bright green mankinins and black wigs in Astana have been arrested and fined. Pictures from the stunt last week showed the men posing by a sign saying “I love Astana” in the windswept and snow-dusted Kazakh capital. “Indecently dressed Czech citizens were arrested,” police spokeswoman Sofiya Kylyshbekova said after the incident, according to local news website informburo.kz. The men were later charged with “minor hooliganism” and each fined about 22,500 tenge ($68). The revealing mankini costumes were made famous by actor Sacha Baron Cohen who used them for his fictional Kazakh TV presenter character, Borat. In 2006, Baron Cohen made the comedy Borat! Cultural Learnings of America for Make Benefit Glorious Nation of Kazakhstan about the adventures of Borat in the United States where his portrayal of Kazakhstan was exaggerated, mostly untrue and very unflattering. The film was condemned by some Kazakhstan officials at the time of its release, but official attitudes appear to have subsequently softened.